Melaleuca ‘Ulladulla Beacon’ is a low growing form of M. hypericifolia that was selected from a wild population on coastal headlands near Ulladulla, New South Wales. The cultivar was registered in 1985. 'Ulladulla Beacon’ is a low, spreading mounded ground cover that reaches a height of 50 centimetres with a spread of at least 1.5 metres. Its lance-like leaves are light green and about four centimetres long. 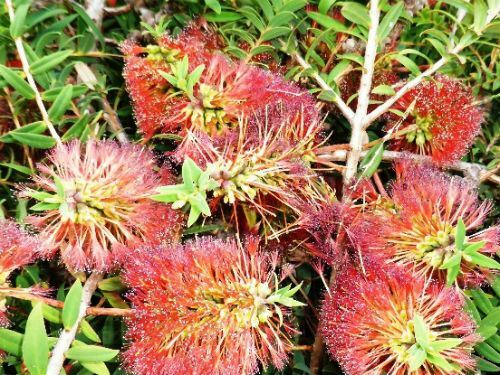 In spring and summer plants produces many large orange-red bottlebrush-shaped flowers. The brushes are both conspicuous and prolific. Blooms are rich in nectar. Flowering extends through spring and summer. Growth habit, foliage and flowers are all attractive features. The upright form of M. hypericifolia tends to hide the flowers amongst the foliage whereas the blooms of 'Ulladulla Beacon' are presented, for all to see, at the ends of branches. M. ‘Ulladulla Beacon’ is a beautiful mounded ground cover. The dense foliage becomes living mulch as well as inhibiting weed growth. The flowers are a magnet for honeyeaters. ’Ulladulla Beacon’ could be grown on embankments and retaining walls as well used as a hedging plant along pathways. This cultivar grows abundantly in our cold climate garden.